St John’s sits at the entrance to Spon Street, that rare enclave of medieval architecture in Coventry’s mostly post-war city centre. Being on the fringe of city’s heart it generally gets less attention from visitors, thus one feels that in any other setting it would be far more celebrated, George Gilbert Scott, who restored the church in 1877, considered it ‘one of the most beautiful churches in England’. The church luckily escaped major damage in the November 1940 Blitz that destroyed so much else in the city, beyond the loss of much (but not all) of it’s Victorian stained glass. The church was founded in 1342 by Queen Isabella, mother of Edward III, but most of what we see today is 15th century work, though evidently of different phases. The church sits on a relatively small site, but what it lacks in length and width it gains in height, and with it’s tapering and unusually narrow clerestorey windows and central tower it gives the impression of a cathedral in miniature. The tower has oddly corbelled-out turrets at it’s corners, an over-exaggeration of the original design by Scott; his main intervention on the exterior otherwise was the renewal of much of the stonework, since warm red sandstone is one of the least resistant to weathering. The interior is surprisingly light for a sandstone church, the result of the large Perpendicular windows and extensive clerestorey that creates a ‘glass cage’ effect in the higher parts of the church. It is also rather narrow, which accentuates the proportions and sense of height further, a good example of architectural limitations and constraints turned to an advantage. There are some good medieval carvings surviving higher up, but otherwise aside from the fine Perpendicular architecture itself the impression is largely of early 20th century High Church Anglican worship, as most of the furnishings appear to date from this time, though they are nonetheless attractive and sympathetic to the building. 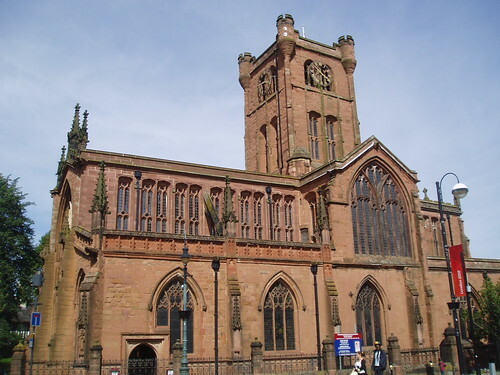 The lack of any relics of the Middle Ages in wood or glass or monuments of later periods is explained by the history of the church, since it actually ceased to be used for worship in the 1590s and for several centuries suffered various indignities of secular use, such as a prison for Scottish rebels captured after the Battle of Preston during the Civil War in 1648 (these rebels, loyal to the King, were shunned in the Parliamentarian held city, thus the phrase being ‘Sent to Coventry’ was born!). Other uses included as a stables, a market and a winding and dying house for cloth, before being eventually restored to church use in the 19th century. We should at least be glad that being put to other uses at least preserved the structure through it’s centuries of hibernation. The church posesses an interesting mixture of stained glass, from Victorian and Edwardian pieces that survived the bombing, to the more prominent and colourful windows installed in the 1950s. However it is interesting to note how the postwar glass here predates the nearby Cathedral’s windows by only a few years, but is still highly figurative and traditional in approach, thus still a far cry from the revolutionary new works that Coventry became famous for less than a decade later. St John’s is open on saturday mornings but otherwise kept locked owing to concerns over security. Sadly it has suffered attacks from stone-throwing idiots on several occasions in recent years (I have repaired minor damage to several of the windows here) but the parishoners remain welcoming and friendly in spite of a difficult environment. It is a lovely church and well worth a visit.